We elevated the British crew slightly, but downgraded their commander - even I could not bring myself to envisage Rear-Admiral Saumarez as 'brilliant' after his conduct in the previous battle - and reduced the quality of the French and Spanish crews as well, for test purposes..We also assumed the battle took place in daylight and without the loss of the two Spanish 1st rates. 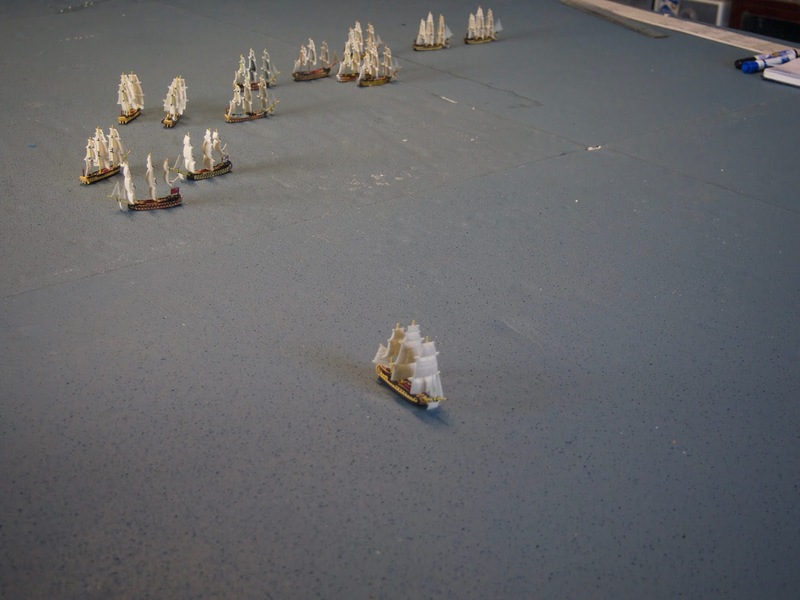 Sails of Glory have now expanded their range and we were able almost completely accurately to reflect the ships of the two sides. 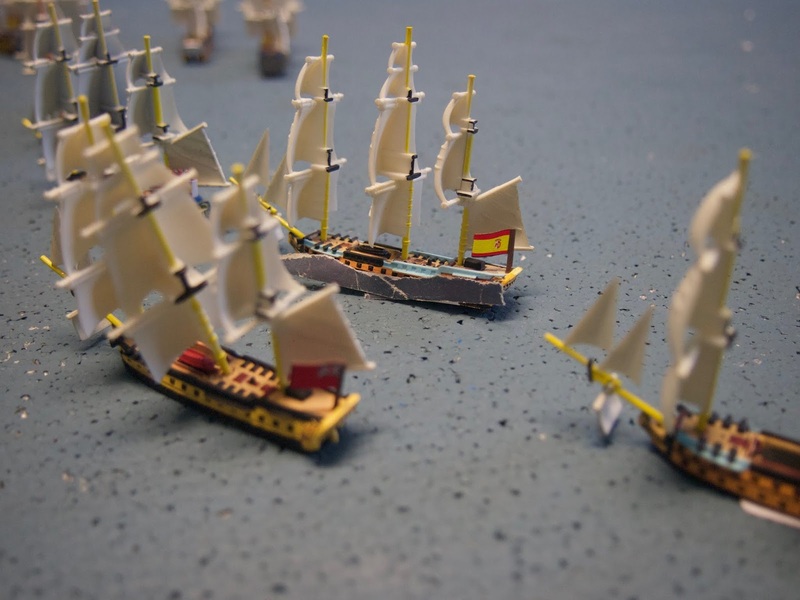 Eagle-eyed shipwatchers will notice that the Spanish 2nd Rate San Fernando is a trifle hefty, whilst both she and one of the Third Rates has a slightly unusual version of the Spanish flag. 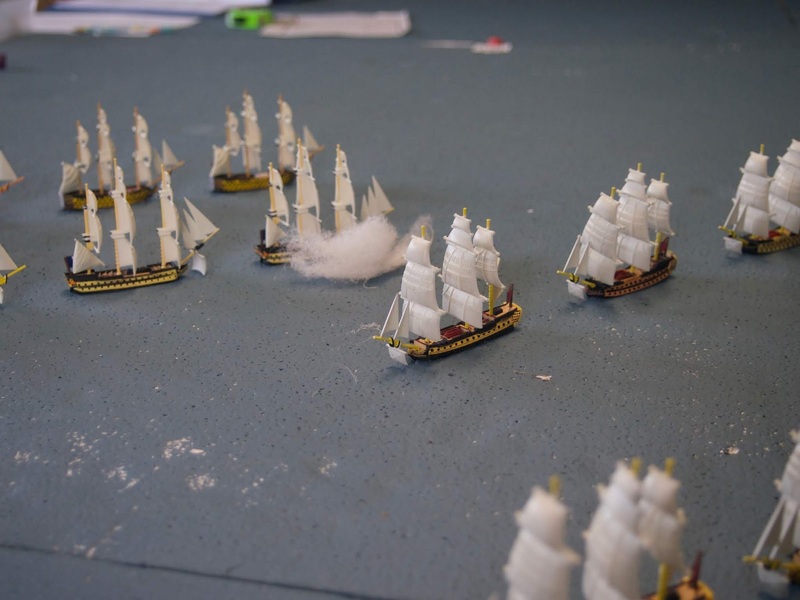 But these are slight quibbles, Ares is doing splendidly in producing these Napoleonic ships. The fleets approached one another. 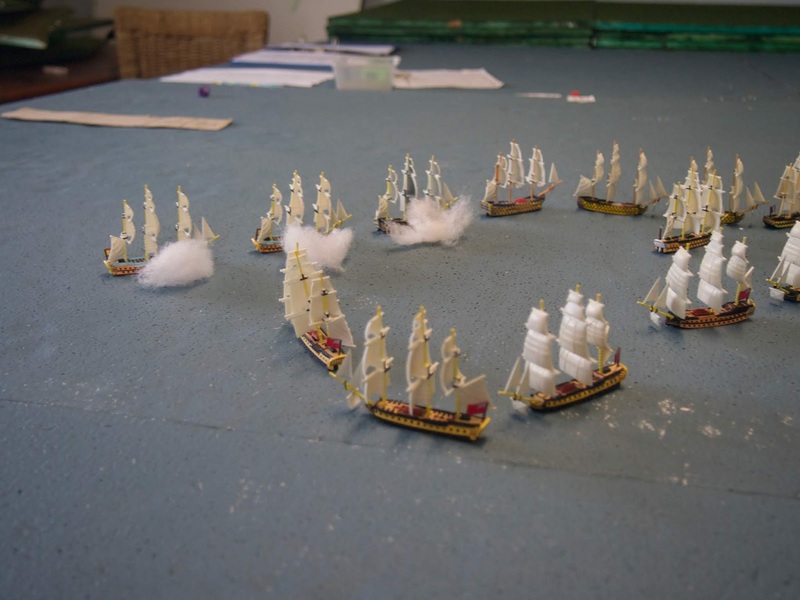 As Saumarez - badly outnumbered - my plan was to simply to steer down his line and cut across to stern rake as many of his ships as possible. The one issue that concerned us was whether the squadrons - two in the Franco-Spanish case, one in the British - would remain within command.The view below from Algeciras town - we simplified by not including the forts. The Franco-Spanish plan, I was told after the action, was to sandwich the British fleet between their two lines, but surely the two lines of British ships would make that difficult to achieve? Movement was straightforward and easy to understand, using the rules. 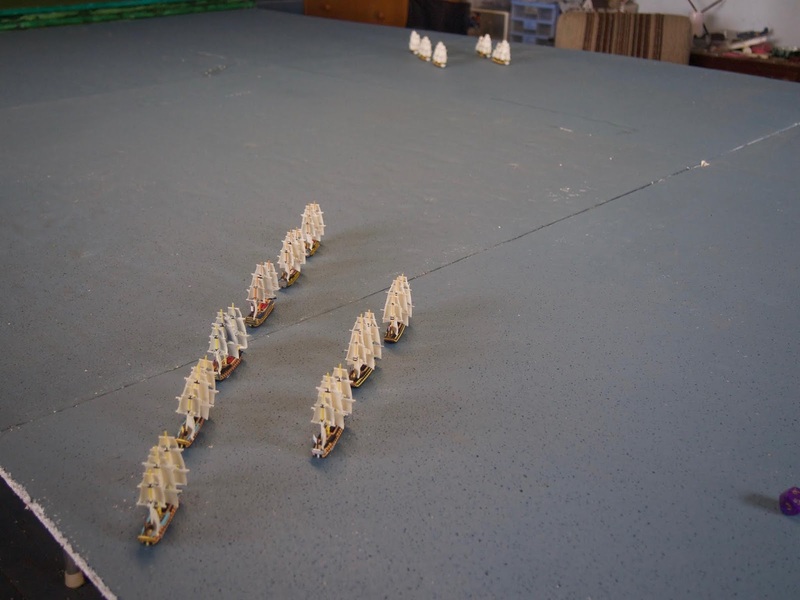 We could see that within two moves the fleets would be engaged. 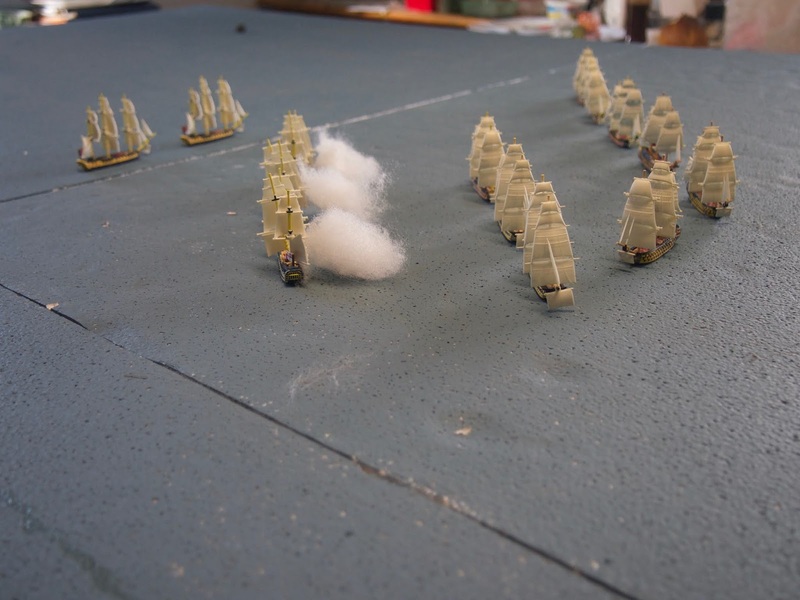 And so they were, by move three, with the British first to open fire. GFA's alternate squadron moving sequence and the simple yet I believe plausible firing system meant no time wasted on complex calculations - essential if this action was to be completed by late afternoon as it needed to be for GFA to work at the large fleet action we need. The rectangular arc of fire from each ship on which GFA insists works well to allocate targets along the line. The Spanish of course replied, immediately inflicting some damage on the head of the British line, HMS Spencer. 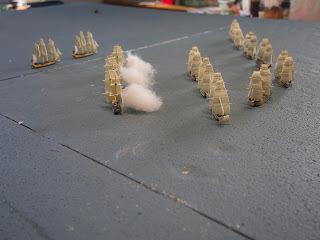 And then the French squadron moved, also firing on the British. As Saumarez I was already somewhat concerned. But if you have a plan and you cannot easily alter it, there is little point in worrying about it, especially in a sailing ship whose speed and direction cannot be moved with any drastic immediacy, so now I executed the turn to starboard with my flagship, HMS Caesar, and HMS Superb (left in the picture below). 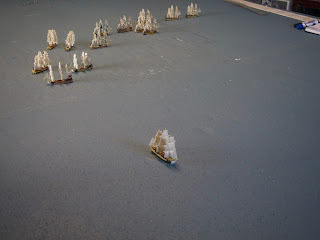 Sensible collision rules prevented the French and Spanish colliding, but it was becoming evident that a single line was the inevitable consequence of the Spanish admiral's decision not to turn to starboard himself early on, as this view from the head of the Franco-Spanish line taking fire in move four illustrates. 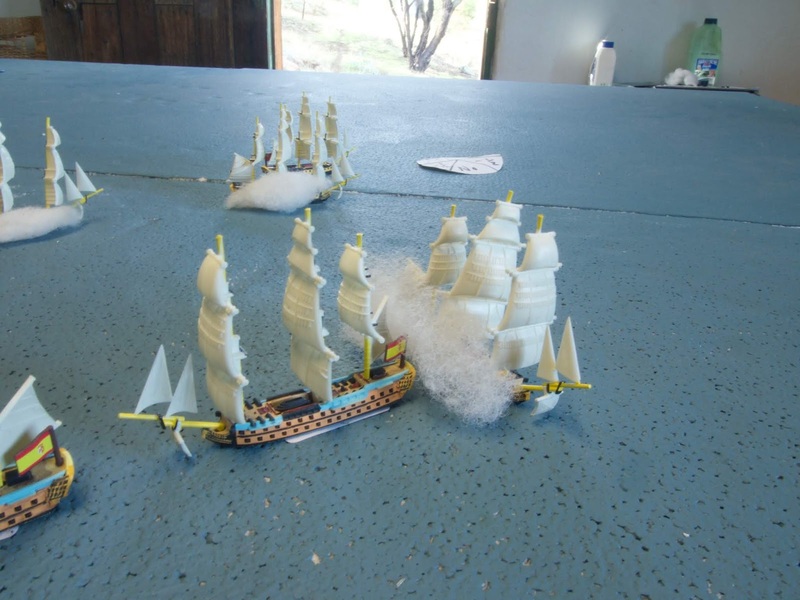 My own ships were now able to cut across his stern, not as impressively as I had hoped but allowing at least some concentration on his rearmost French vessel. HMS Spencer was hit again in return, this was not going entirely to plan, but at least those heavy Spanish 1st Rates were gradually disappearing out of the action. By move six I was eventually able to achieve the rake that I'd been hoping for throughout the action, although a poor die roll savagely reduced its effect. Nevertheless it was delightful that it had been possible by tacking round to place myself where I wanted, as rays of sunlight caught the afternoon action. This ship, I believe it was the Argonauta, having already taken hits from other British ships, was now reduced to hull zero, requiring a test, which she spectacularly failed, foundering as a result, although my flagship had also been seriously damaged and was, we decided, listing as a result. 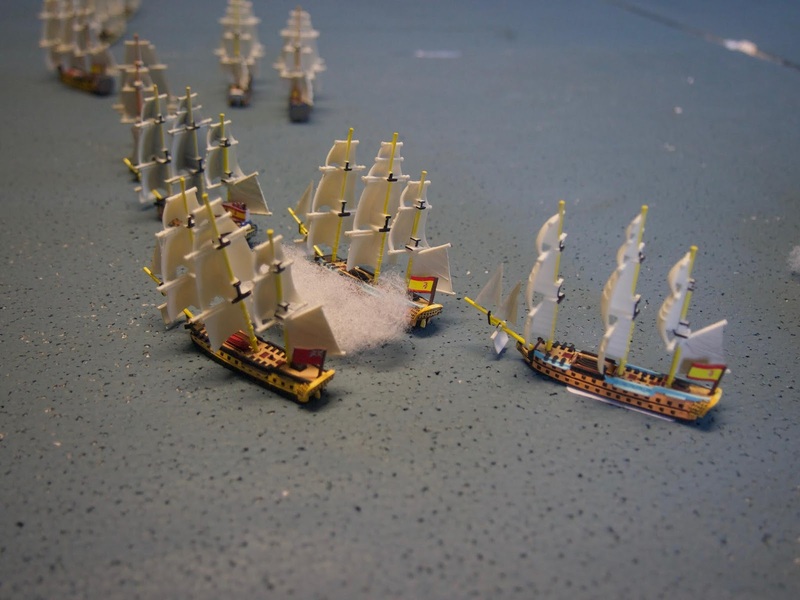 The Franco-Spaniards considered themselves fortunate to have lost only one ship, and made off to the other side of the bay, whilst the British, having sent one ship home already with serious damage, with another ship equally badly damaged, and now out of position well to the West of their foe, also considered it wise to break off the engagement. It had lasted about an hour and a half in game time, and took us around five relatively leisurely hours to complete in real time. We judged the rule test to be a complete success in every respect. We had been worried about the command rules, but the combination of insisting vessels be in command to commence firing and that any vessels out of command had to make reasonable endeavours to place themselves back in command allayed our fears on that score - not that anyone was out of command during our action anyway. The firing ranges relative to speed seemed quite right to us, sailing was neither too demanding, nor unrealistic, nor too easy, whilst record-keeping was straightforward and useful. I even tried to repair one of my ships - without success, I may add, but that rule too worked well. Great looking naval battle, impressive fleets! Thanks Phil. Most importantly though, excellent rules at last! 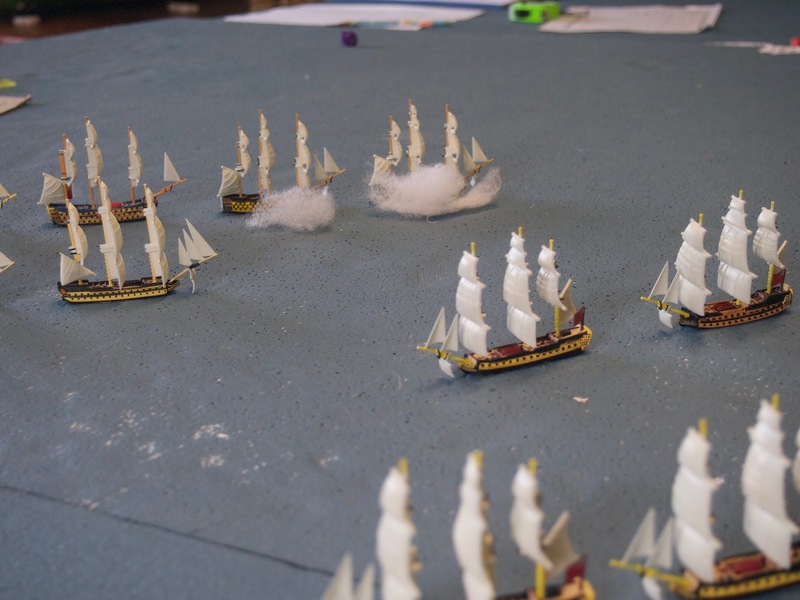 Hooray for hitting upon a workable set of fleet action rules! 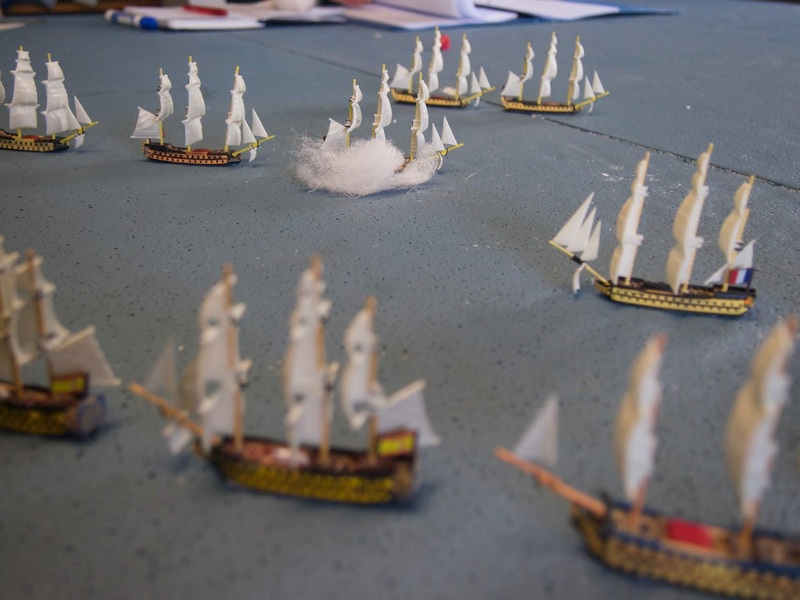 The game looks terrific with long battle lines. The wisps of smoke add much to the aesthetics of the game. More, more more! Thanks Jonathan, it was a great game. Believe me, there will be. The rules are great and I can recommend them unhesititatingly. You can find them at Wargames Vault. I shall have to try these out!